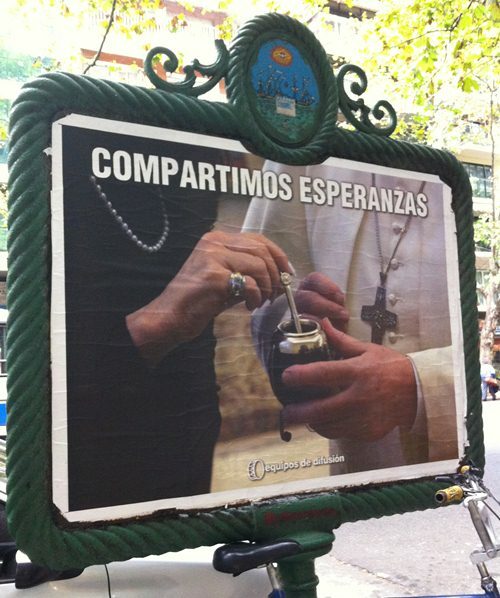 In the weeks after Jorge Bergoglio, former archbishop of Buenos Aires, became Pope Francis, a bunch of posters featuring him went up in Buenos Aires on bus stops, phone booths and walls. Rival political parties put up the banners—all of them claiming the pope as one of their own. The city government (headed by a pro-business mayor who would later become president) had one. So did a labor union. Another, unattributed poster proclaimed the pope was a peronista, part of the party of Juan Peron. But my favorite showed a close-up of Bergoglio and then-president Cristina Kirchner with a cup of yerba mate, Argentina’s national drink of fellowship. We share hopes, it said, even though until that point, Kirchner and the Francis mostly shared mutual dislike. I was reminded of those awkward but predictable intersections of church and state in Michael E. Lee’s new book, Revolutionary Saint: The Theological Legacy of Óscar Romero. It’s a portrait of another Latino Christian leader caught, quite literally, in the cross-hairs of politics and faith. Like Pope Francis, Óscar Romero’s position could have provided deep legitimacy for whichever part of the power structure he chose to support. Nearly everyone was shocked by his choice: to champion the poor. Oscar Romero served as the archbishop of El Salvador for only three years, from 1977–1980. He was assassinated by a sniper while celebrating mass; his murderers were prominent Salvadorians associated with the military government. I had assumed, before reading Revolutionary Saint, that Romero had been a champion of the marginalized throughout his life. But, instead, Romero was a unlikely activist. When Romero was appointed archbishop, those who promoted human rights in El Salvador felt betrayed, while those who supported the military government rejoiced. Romero’s subsequent about-face drew comparisons to the conversion of St. Paul. Lee’s question haunted me. In the weeks since I finished reading about Romero, I’ve quoted and mentioned the book to nearly every Christian I’ve talked to. Romero’s story is compelling precisely because he was such an unlikely hero. Given my life as a rather wealthy American, given my own limitations and cowardice, I find Romero’s fitful progress towards bravery illuminating. He provides a way forward, even if it’s a challenging one. Lee’s book is especially needed given the political times we live in, where repressive, authoritarian, and racist governments are on the rise. It’s also of great urgency here in the United States, where white Evangelical Christians enthusiastically elected a leader who professes few of their values. Reading how faithful Christians in El Salvador justified their cold-heartedness both chilled and enlightened me. I was reminded how easy it is to blind ourselves to our neighbors’ suffering. Lee does not aim to give readers a full biography of Romero—at just 200 pages, the slim volume only gives a brief outline of the archbishop’s life. Instead of biography, Revolutionary Saint focuses primarily on Romero’s theology, drawn from his homilies, diaries, and other primary source material. Lee concentrates his survey of Romero’s theology on three topics: conversion, politics/discipleship and martyrdom. I appreciated Lee’s nuanced view of these theological ideas—both honoring their importance and teasing out how they’ve been abused. For example, though conversion is a sacred part of Christian life, it has also been used forcibly, as a weapon of oppression. Similarly, the church values martyrdom, proclaiming a crucified Christ. Yet in the age of suicide bombers, it’s essential to think about what, exactly, is laudable about dying for one’s faith. With each theme, Lee explores how Romero moved from a dualistic, tradition-bound, and theoretical theology towards a more complex, empathetic, and deeply practical one. First, we see how his understanding of conversion transforms from a once-and-done decision to a continual submitting of one’s heart, soul, mind and strength to God. Lee makes clear that Romero was a deeply faithful Christian before he awoke to the plight of the marginalized in El Salvador. Yet that sincere faith was not enough to confront the violence in his country. Following Christ required not a single commitment to abstract theology, but an ongoing, practical process of questioning, repentance, and desperate reliance on God. Lee also shows how Romero moved from separating politics and faith to realizing that they were connected. Though Romero stayed committed to non-partisanship, he realized that “neutrality” about the murder of unarmed civilians, the falsifying of votes, and the deep inequities of his society was, like it or not, lending those injustices support. Finally, Lee examines how Romero struggled to understood the witness of martyrdom while surrounded by murdered priests and parishioners. As time went on, he began to insist that every Christian must imitate martyrs’ commitment to the reign of God. Though we are not all called to seek and glorify death itself, we are each commanded to be boldly obedient and loving regardless of the cost. Though Lee’s account on Romero’s theology and life deeply moved me, the book wasn’t an easy read. Despite its brevity and Lee’s stated desire to appeal to a wide audience, Revolutionary Saint uses a lot of scholarly jargon, elevated language, and assumes a little too much familiarity with the Catholic church for the average reader. The book’s structure is another hurdle, because rather than moving chronologically, it progresses thematically, a harder organizational challenge. Sometimes, it means that key information isn’t in a logical place—like the explanation of what, exactly, liberation theology is, which doesn’t appear until late in the book’s conclusion. Sometimes, the structure felt repetitious—Lee often examines the same event from three different thematic angles. I wish Lee had managed to integrate the material into a more seamless whole to aid the reader in his worthy task: understanding Romero’s dependence on and obedience to God. Still, for those seeking a master class on how liberation theology can transform a Christian’s life, Revolutionary Saint is a worthwhile read. The powerful theology is made deeply personal by Romero’s story. Rather than an idealistic, tidy narrative, reading about this soon-to-be saint illuminates just how troubling, confusing, and perilous following Christ can be. Faced with the very real danger, Archbishop Óscar Romero chose to follow his Savior into the valley of the shadow of death. May we all see the choices that lie before us so clearly.